The cover page is the very first page of a document. Besides displaying the title of the document, this page should also contain other important information, but the cover page layout details will differ depending on the particular document. You’ll find a selection of attractive cover page templates below which are perfect for expressing your creative side. A cover page shouldn’t be confused with a cover letter. Cover letters typically accompany a resume. A cover page, however, is the title page for business reports, academic papers, proposals, white papers, and other documents. You’ll have slight variations in MLA versus APA style, but these are the general details you can expect for academic or business documents. Elegant and professional business cover page template. This can be used by technology company as a cover page for different documents: reports, white paper, flyers and other business documentation. Most of the templates for cover pages below are best used for more creative fields instead of strictly professional ones. If you work in an environment where you’re allowed more freedom of expression, these templates will work for you; this can include the arts or fashion industries. If you have a more serious academic paper or business proposal to turn in, other cover page templates will probably be better suited for your needs. A business report, for example, should be straightforward and completely professional. If your document is a book or story collection, you can customize the templates on this page to reflect that. Instead of the information you might provide on a typical business report, you can use cover pages to list the chapters in your book or the titles of your stories. For example, the cover page template featuring a man relaxing at home with his faithful dog by his side could be used as the cover page for a homemade scrapbook featuring your pets or a collection of funny stories about your family. Because these templates are designed with a more creative slant, feel free to let your imagination take the lead on how you use them. No matter how you design your cover pages or adapt the cover page layout, don’t cram it with too much text or too many photos; one cover photo is often enough, two images should be the maximum. This page is designed to let readers know what’s inside and what they should expect. Let them get further details once they turn the page. Templates in our cover page gallery below allow you to express yourself, whether you wish to show the whimsical, creatively professional, or funny side of your personality. You won’t have to spend time and effort coming up with a design yourself. Instead, choose a color scheme and design you like. If you cant find a custom cover design you like in our gallery, you could also create a cover with Microsoft’s build-in cover page designs. Bright and powerful cover page template to be used for business documentation of any company. Blue abstract design can be used for a variety of business documentation. Made in word, easy to edit. Modern abstract design cover page template to create professional-looking documents. White and yellow lines elegant free cover page template. Powerful bright cover page template, yellow and gray design. 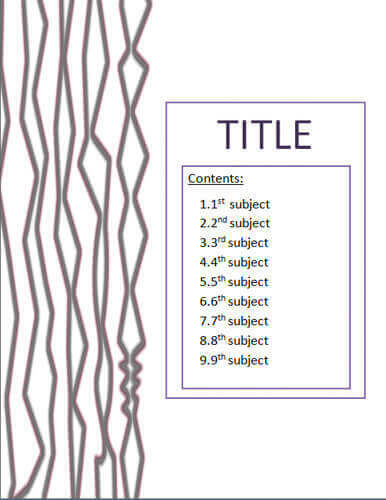 Stylish book cover design with place for title, table of contents, and book description. Blue cover page with green and brown lines. Creative white and black grunge cover page design. Very simple and elegant professional business cover page template. Use for reports, research papers, school papers, and any other document. Purple and green bars in both sides cover page template. Romantic rose design with hearts. 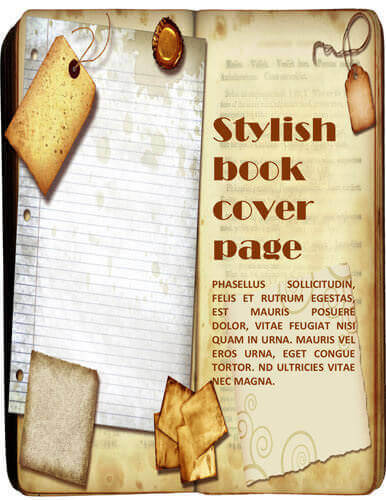 Stylish cover page template, autumn theme with orange and brown colors. With a notepad / paper in the background. Blue and green design with space for title and contents. Mr Granty cartoon character cover page. Smiling sun cover page, yellow and orange colorful design theme. Man with his dog at home cartoon style cover page. 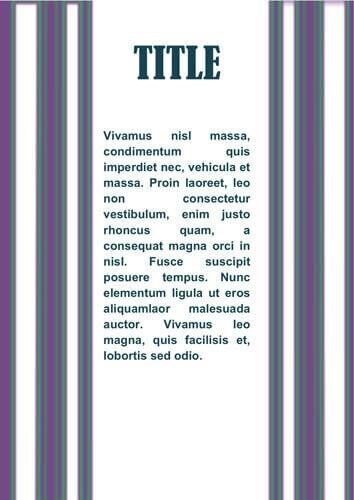 Creative cover page template with zigzag lines on the left side.